I know, ugly photo. But it shows the flowerbed in my backyard where I got a tick embedded in my hip one summer. And a bull’s-eye rash soon after. 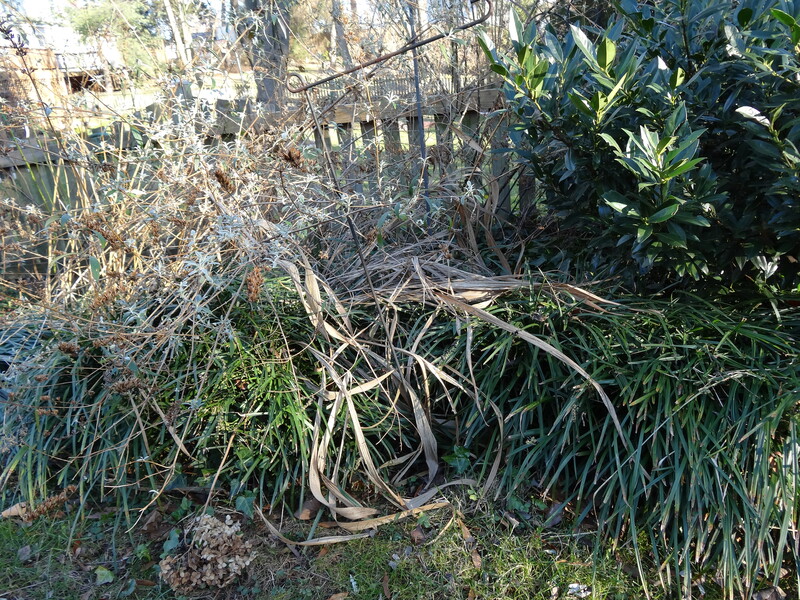 And pretty soon was very, very ill.
As you can see, my garden is in a sad state these days. Last summer and fall I was too sick to clean it up—and besides, I was very afraid of the danger lurking there. I said to myself, I’ll feel better in the winter. I’ll get rid of the dead things when the ticks are gone. Flash forward to the middle of winter. Someone in my support group reported that she’d just come inside her house and done a complete tick check—in January. In Virginia. And found a live deer tick. We were shocked. I’d assumed that once temperatures dipped below freezing, ticks were done for ‘til spring. Now I know otherwise. A study of the Lyme-transmitting black-legged tick (Ixodes scapularis) published in the Journal of Medical Entomology just last year investigated winter survival in two locations in New York. The finding? Despite winter conditions, more than 80% of the ticks survived. A researcher in Rhode Island collected plenty of ticks after a hard freeze, and suggests they must have some kind of “antifreeze” enabling them to survive in frozen ground. Climate change is playing a role. Health officials in many places including Minnesota cite milder winters as one reason for the increase in Lyme. Clearly, the cold months are not the time to let down your guard. I’m already thinking about spring, when each female tick will produce 1,500 eggs or more, according to the TickEncounter Resource Center at the University of Rhode Island. Their website says tick activity is high in the western U.S. right now, and rising elsewhere as spring approaches. So I’m working on a list of tips to stay safe. Come back soon to read that post, and in the meantime: Check for ticks. This article from National Geographic is an alarming look at ticks moving north as well as being active in winter: Ghost Moose. I pulled 2 off my dog in the last month. I live in VA and we have had some really cold weather. This is scary! They’re everywhere. 😦 What’s your favorite tick repellent? The CDC suggests products with t least 20% DEET, and permethrin for clothing (never put on skin). See more here: http://www.cdc.gov/lyme/prev/on_people.html.